Fort St. John. 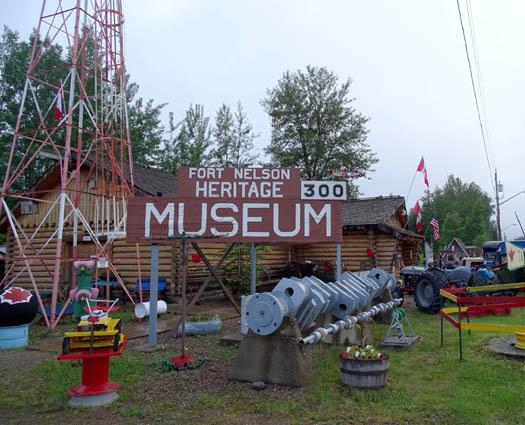 The Alaska Highway linked Fort Nelson with the Outside in 1942." That's Canada-speak (and also Alaska-speak) for folks like us who are just visiting. 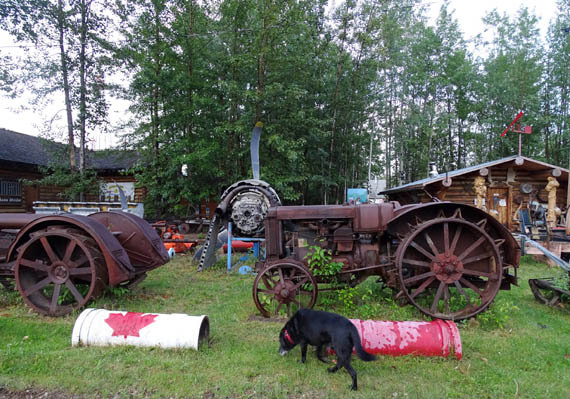 Once again we are using The Milepost book as one of our main references on northwestern Canada and Alaska. We purchased the newest edition when it became available at Amazon this spring. 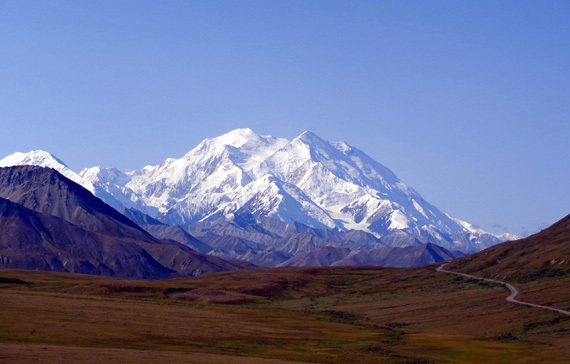 In the last entry I mentioned Alaskan Camping by Mike and Terri Church. 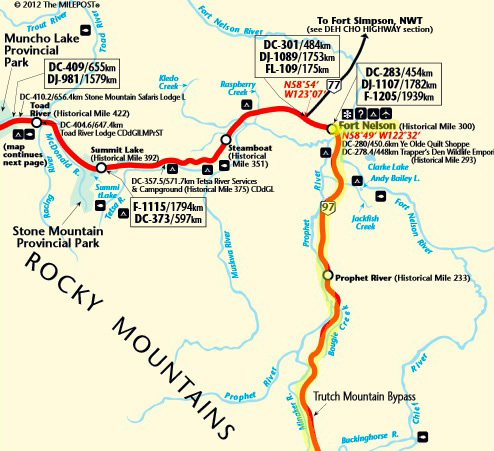 It has lots of campground information for British Columbia and the Yukon, as well as Alaska. Unfortunately, I wasn't able to determine before our trip this year if a current edition was published so we just used the same edition we bought in 2012. About the only patch of blue sky we saw on today's drive; rain already fell here. Both of these books provide a wealth of information for all of the routes to Alaska. 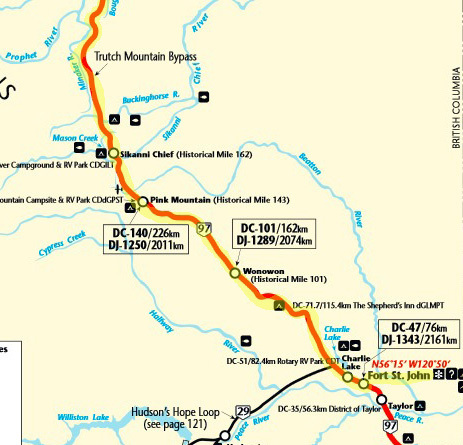 In addition to routing and campground information, one or both also include relevant historical and cultural facts about each area and recreational and sight-seeing opportunities. I think both books are indispensable during a motor trip to Alaska, especially in remote areas where phone and internet connections are nonexistent. The Milepost is great even if you aren't camping. Our luck with good weather ran out today. It was deja vu all over again in this section, where it also was raining on our way north to Alaska three years ago. I always wonder what fabulous scenery I'm missing when it's foggy or raining . . . This time, fortunately, there hasn't been nearly as much rain in the days prior to our trek or all the June snowmelt from that year. Today's near-constant light rain and some fog just made for more difficult driving, limited views, and hardly any photos. We don't anticipate any flooding or road washouts to hinder our progress. This was our shortest day so far, less than five hours on the road with several short stops. 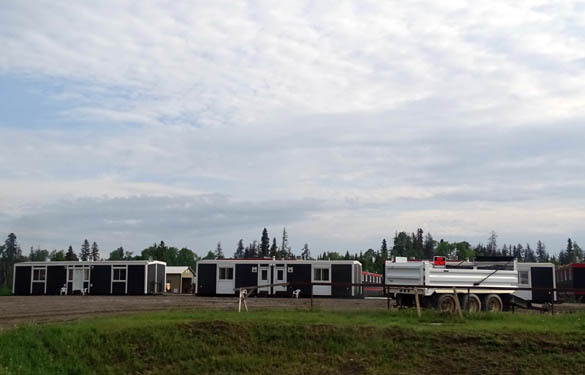 Unfortunately, because of the rain we spent most of the afternoon and evening in our camper instead of being able to enjoy a long walk and bike ride in Fort Nelson. Jim drove slower today because of the weather conditions. 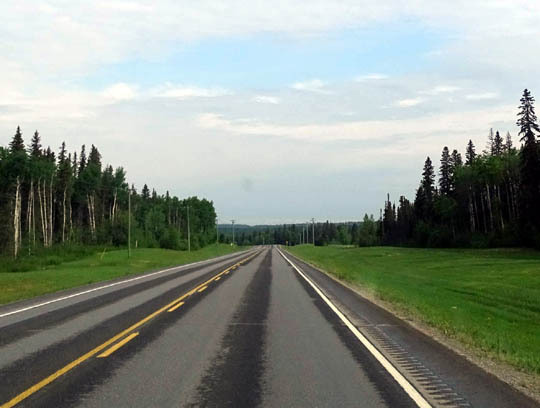 TRAFFIC & ROAD CONDITIONS: Moderate traffic -- more than we expected -- for about two hours north of Fort St. John, apparently because of all the gas, oil, and lumber facilities off the road; light traffic the rest of the way to Fort Nelson. Road surfaces were fine for RV travel. for seasonal and year-long gas, oil, and lumber crews. Other workers stay in RVs. TERRAIN: More long hills down to rivers like the Sikanni and back up again. Streams are full, fast, and muddy but not overflowing. Some small marshes near the highway. Some horse and cattle ranches but mostly trees on either side of the road. As we traveled north and rode at 3,000-3,400 feet elevation the pine trees were shorter and thinner, similar to those in Denali National Park in the tiaga. I also noticed more lichens on the ground. Still no wildflowers obvious from the road except dandelions. 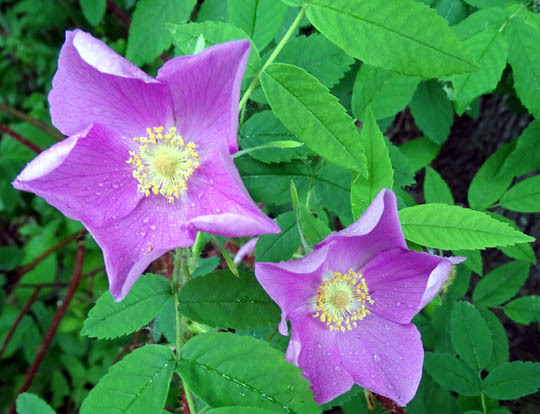 There are pretty wild roses, bunchberries, and mountain bluebells at the Triple "G" Campground. I remember those from three years ago. WEATHER: Rain and chilly (only in the 50s F.) all day until the sun popped out at 8 PM. 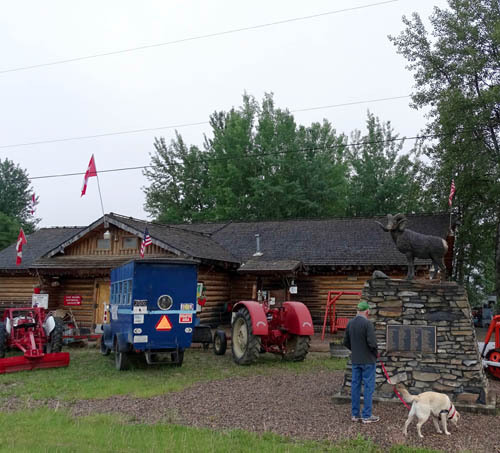 As soon as we saw that the rain had stopped, we walked the dogs next door at the outdoor museum with all the old vehicles, equipment, signs, etc. 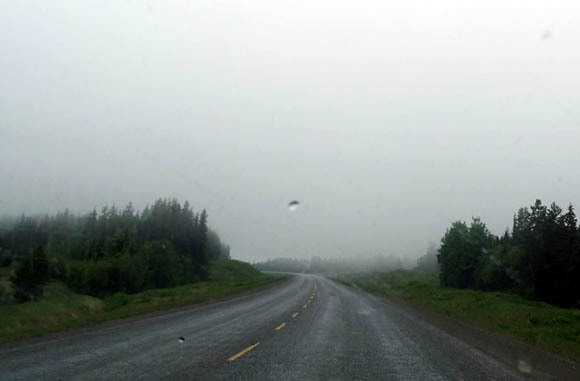 Just hope it clears up overnight so we can see all the great scenery on our route to Watson Lake tomorrow. This is our third time here overnight. We stayed in this campground both northbound and southbound in 2012 because it was conveniently located. 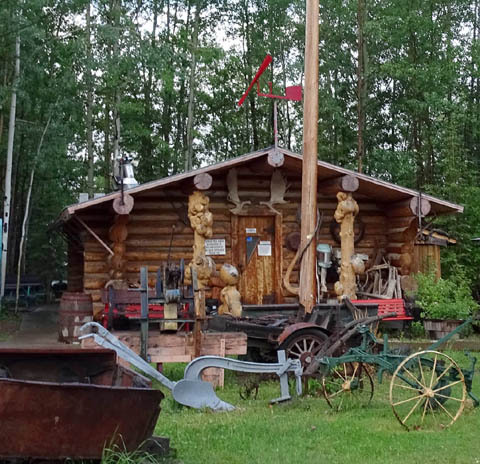 This is the last major RV park before the Alaska Highway climbs through the Rockies, where there are fewer full and partial-hookup camping options or places with WiFi and TV. 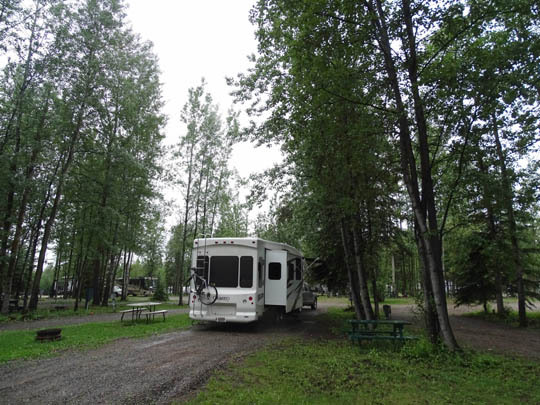 There are several more primitive but very popular scenic campgrounds in provincial parks like Liard River Hot Springs and Muncho Lake, however. When we got here a little after noon we had our choice of many of the 130 sites. By suppertime the RV park was about 80% full. As you can see from the photos there are a lot of tall trees in this campground. We have full hookups, a decent WiFi signal, and cable TV for $42 CA (about 20% less in U.S. dollars). We were able to watch the CBS and ABC evening news broadcasts, Jeopardy, and other shows Jim was interested in. Although the weather is depressing we're warm and comfortable in our rolling residence. We have our fingers crossed for a clear day tomorrow. The section from here to Watson Lake is simply stunning on a sunny day.